I entered Legion not caring that we wouldn’t be able to fly until some nebulous point in the future. I really didn’t mind that my flying mounts, especially the Drakes would be left languishing in their stables but then something caught my eye and suddenly not being able to fly began to rankle. Yep, the Dalaran Flight Master has a right little racket going on…he’s charging us for using our own flying mounts. At the moment the only mount capable of flight I have marked as a favourite in my mount list is my Ironbound Proto-drake. 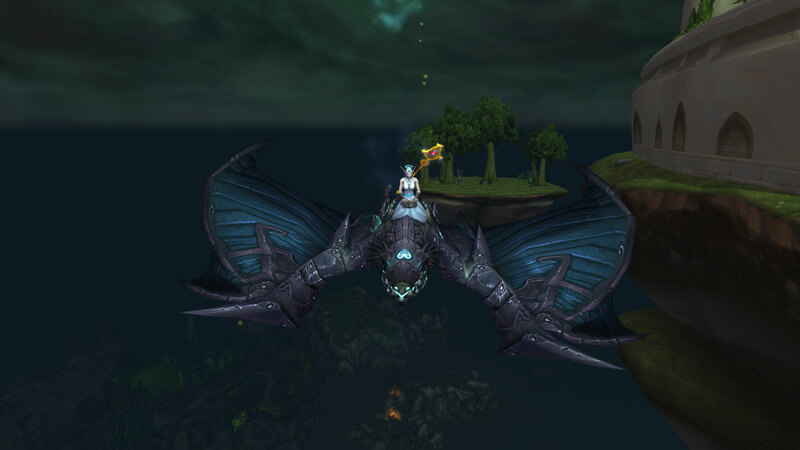 Feel free to guess which mount Mr Whitecloud always sends me flying away from Dalaran in…if you need a clue it’s a Protodrake of a distinctly Ironbound variety. Further testing suggests that if you have multiple flying mounts marked as favourites, your leaving Dalaran flight will pick at random from those. If like Mr Harpy, you don’t have any favourite flying mounts, the game will just select one of the flying mounts from your collection. On the one hand, it’s great to use the mounts that you might not be using at the moment. On the other, it’s a bit cheeky to charge us for the privilege. 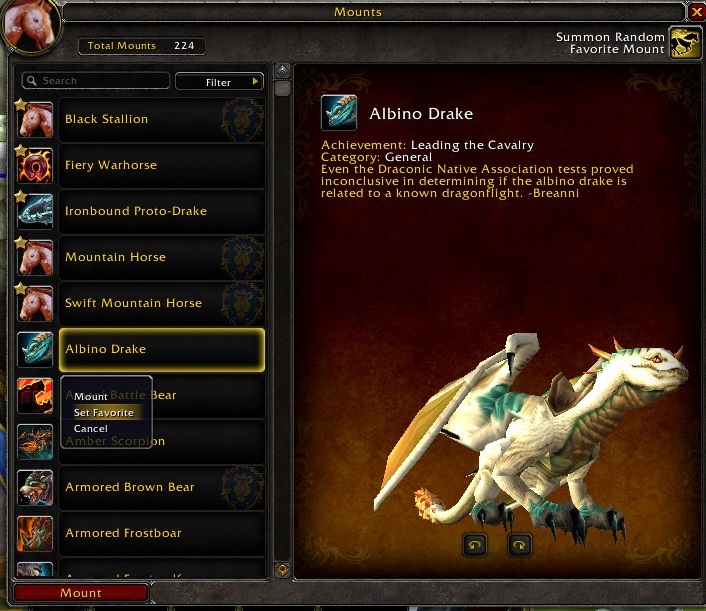 To add a mount to your favourite list, you just open your Mount collection up and then right click on the mount you want to favourite. My eye is often caught by shiny things, in that regard I’m far more of a magpie than a harpy. So when I noticed this on Meat Vendor’s Tumblr, I filed it away for future reference. I know quite a lot of bloggers have been doing this for April but I don’t have the patience to write every day especially in the month I’ve had to sacrifice chocolate on the altar of lent so this is going to be much more of a random affair. This is surprisingly tricky for me. 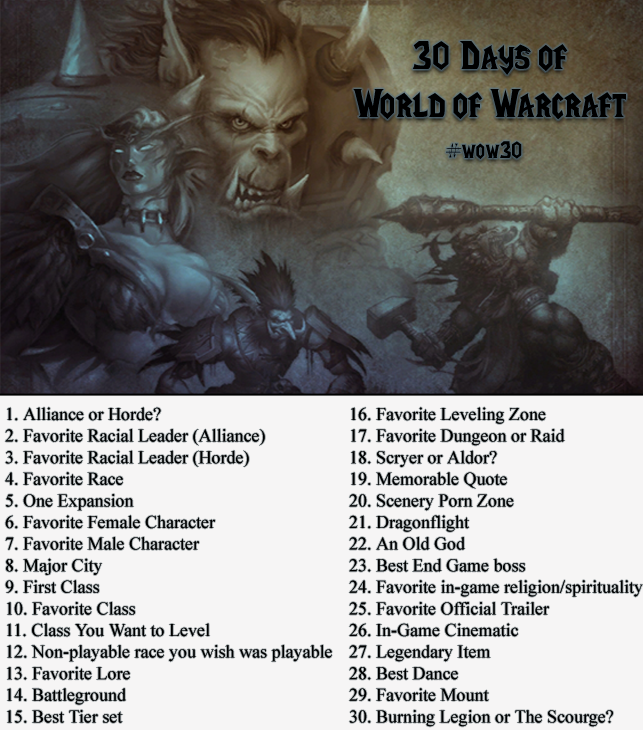 I primarily play Alliance, a faction picked way back when because at the time in order to be an Elf you had to be Alliance but is that where my heart lies? I thought I knew the answer to this but some how, I’ve ended up writing something very different down. Instead of extolling the virtues of the Horde, I lost myself in memories. I think about the music in the Valley of Heroes and I see Bolvar Fordragon at the Wrath Gate. I remember my first visit to Darnassus where I was blown away by the sheer size of the city and the delicate beauty of the Temple Gardens. 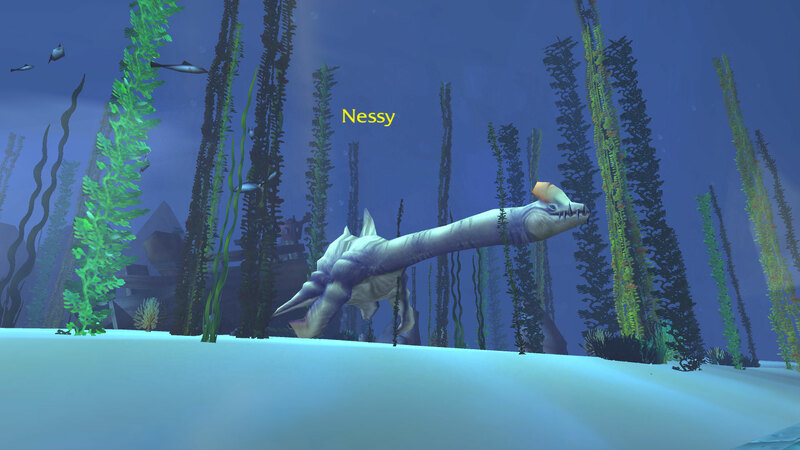 I mean the Horde don’t have Nessy in their tunnels do they? Add in Gnomes, the fact that Humans and Worgens get proper horses as their racial mounts and Darkshire, well then… there is no escaping it. I’m a blue eyed Alliance girl through and through. 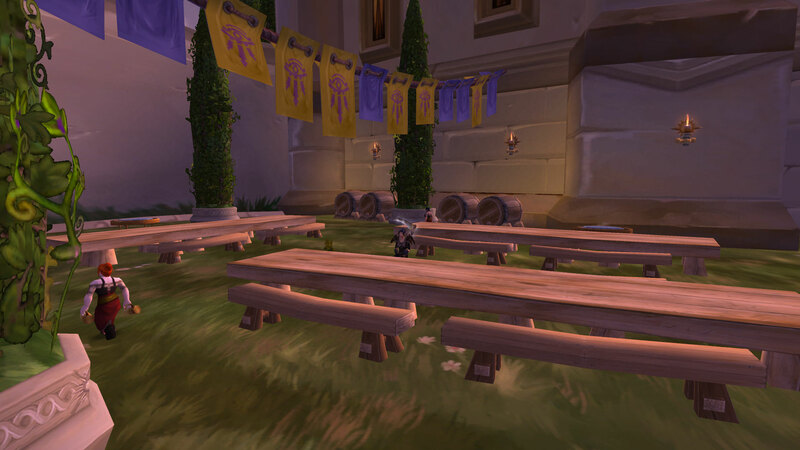 Being the only faction with a beer garden in Dalaran is just the royal blue icing on the lion cake. The two faction specifc zones are very different. The Horde one (The Sunreaver’s Sanctuary) seems smaller and a lot more spit and sawdust. The Innkeeper is another scary female Orc in the tradition of Sergra Darkthorn and she guards the door with two big hungry wolves. It seems more suited to a Barrens outpost than a civilised and charming city like Dalaran. Sure, I can imagine sleeping off a hangover in front of the fire, or collapsing on one of the hammocks after a bit too much bitter cactus apple cidar, but compared to the Alliance quarter it lacks something. That said, the huge platters of food, the barrels of apples and cheeses in the cellar and the dancing troll barmaids make the place feel a lot more lively than most of the current drinking spots. Also how can you not want to drink in a watering hole called the “The Filthy Animal”? 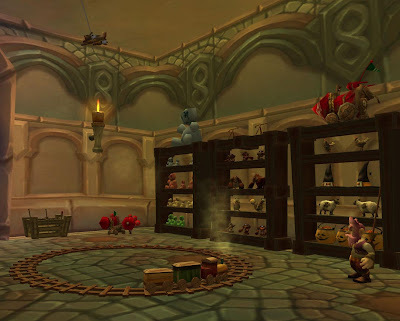 The contrast between the Inn and the Horde badge vendor is huge, we are back to Silvermoon cityesque architecture, lots of cushions and spinning bookcases. The battlemasters (well portals) are split between two rooms, one of which has a huge hole in the floor.. yes its an accident waiting to happen. Ok you only fall on top of a fountion and can just run back up the stairs but its not the best design for a room which is likely to be used to so much. On the other side of the city we come to the Alliance version. Instead of “The Filthy Animal”, we find “A Hero’s Welcome” (Are the developers trying to tell us something?). This time its a charming inn. Mariposa can easily imagine sipping honeymint tea at corner table here after a hard nights raiding, or a relaxing with a warming glass of snowplum brandy in the beer garden. Yep, you read that correctly, the alliance inn has its own personal beer garden complete with dwarfen beer maids. Upstairs if you are a little too drunk to make it home, there is a very inviting looking fourposter bed just waiting to be sunk into. Perhaps if the night is mild you could even grab a few drunken hours sleep on the benches in the beergarden. Unlike the Horde version, the Alliance quarter is linked by a series of balconies complete with windowboxes and there is even a tower, ok its currently a pointless tower, but its alliance only. The portals leading to all the alliance cities are housed in the courtyard leading to the battlemasters, with plenty of seats and a mailbox. Again the theme seems to be that of spaciousness, light and fresh air. It might just be perception, but the Silver Enclave definately seems a lot more spacious and better laid out than the Horde area. No tricky holes to fall into, no cramped rooms which when full of taurens really will be a squish. Alliance and Horde zones aside, there is plenty more to see in Dalaran. The Purple Parlour, the highest point of the city is obviously the hang out of choice for the literary elite. Arcanist Ginsberg and Alchemist Burroughs can be found deep in conversion, and Scribe Whitman is outside on the balcony bemoaning the fact that he left his light feathers at home… seems he needs to glyph for slowfall. Underneath the City, something lurks. Candles light the way down into the darkness of the sewers, torches casting flicking shadows on the dank and slimy walls and best not dwell on the liquid streaming around your feet. Divided into 3 main areas, the Underbelly (I love that word) is the dark side of Dalaran. The Black Market is just what is says, home to a few “dodgy” vendors, selling the likes of poisons and a ghostly skull minipet. Just dont fall in the water, that could be a little fatal. Then there is the Circle of Will, a dueling zone with arenamasters, arena vendors and a grim warning to those who contemplate win trading. Finally we reach the last Inn in town, “Cantrips and Crows”, a waterfront dive. There are some familiar faces, still fighting, food and drink (if you are brave enough – where exactly does sweetened goats milk come from in WoW, should my spacegoatsquidthing be scared?). Naturally this is a much more basic house (probably of ill repute), but down in the dark it has a certain atmosphere and I can see my little Orcling Honeysuckle feeling at home here… the Orclings are always spoiling for a fight. The Underbelly also offers some of the best fishing in town. Its easy to imagine sitting down there with a cold beer, pickled eggs and radish kimchi plus something to throw at the rats to keep them off you, your lunch and anything you catch. All in all, Dalaran has something for everyone, for the first time with a WoW city I can imagine all my characters finding their very own little space in the same town. My druids are sussing out sunspots for sleeping amid the windowboxes or searching out roaring fires to catnap besides. Mariposa is planning on working her way through all the bookcases in town and Dorn, well she rather fancies finding a nice relaxing bench to watch the world going by. The food has a very farmer’s market combined with upmarket restaurent feel for the most part. Who could resist buying Apples straight from the tree, although Im a little dubious as to where he gets the juice from. Probably best not to dwell on that. The cupcake stall is just gorgeous although I have a reallife thing for cupcakes so yes, im biased. Like all cities, Dalaran has a number of spots to eat. You can stick to your own faction specific spot and eat in your respective Inn. The Horde serve up plates of mead basted caribou and savoury snowplums accompanied by crusty flatbreads, all washed down with mulgore firewater. Across town in “A hero’s Welcome”, the alliance are serving slabs of sweet potato bread covered with sour goats cheese and poached emperor’s salmon, accompanied with honeymead. If hanging out with only your faction isnt your thing, there is Legerdemain Lounge which seems on the beta at least to be the most popular joint in town. An Art Deco establishment, the lounge with its glass tables, book cases, candelabras and potted plants offers a relaxing place for a drink or food with friends. Upstairs there are rooms for those too tired or too drunk to make it home and a balcony overlooking the street, perfect for a drink in the evening. Or you could pop into “One more Glass”, where Fialla Sweetberry serves glasses of aged dalaran red and tundra berries on the street. Inside yet another member of the Trias family is selling cheese and no doubt spying on someone or something at the same time. If you are brave enough you could join the pvp crowd down at the Cantrips and Crows, but thats literally taking your life into your hands. Or for a more romantic picnic, there are plenty of places to sneak off to, where you can lose yourself and forget that you are in the busiest city in Northrend. The biggest plus of all: No more lethal Aldor Rises, although obviously falling off the city itself would be fairly lethal, but thats impossible to “accidently” do. Ive been delibrately avoiding writing about the beta, but I just cant help myself in this case. This post has been writing its self in my head over tbe last couple of days. I love Dalaran. When I was a little girl I used to love hanging out in the Lighting Department of our local Department Store, I thought it was fairyland, all that brightly coloured glass and the balls of light. 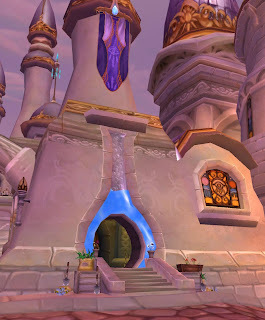 My first thought when I saw Dalaran took me straight back back to being 5 years old again, staring up at the light in wonder. Unlike Shattrah, it feels like a proper city. Cobbled streets, wizards wandering the streets chatting to each other, or standing on the street quarters gossiping. The majority of NPCs all have names which helps create the atmosphere, Bitty Frostflinger the cute little gnome mage chatting away animatedly or Goldlily Gleamingfell, the artic blonde bloodelf watching passers by reservedly. Ok, its a cross between Disneyland and the Arabian Nights mixed with a healthy dose of Harry Potter, Kitsch only just begins to cover it, but its fun. The shops have a European boutique feel, you name it, someone in Dalaran will sell it to you. From fetish bandage outfits and nurse uniforms, cupcakes and fetch balls for our pets, its all there just waiting to be bought. Yep, ive bought it all. Each store is decorated in a manner benefiting its contents, making each one a beautiful jewel on its own. You can spend hours just wandering around looking at things, drinking in the view. Spend sometime in the greenhouse watching the flowers grow at your feet, a testament to the power of the herbalists, or maybe pop into the Sisters Sorcerous and watch as Badluck (the family cat) slinks around, one moment hes perched on the counter watching for shoplifters, the next hes curled up in the corner fast asleep and snoring. 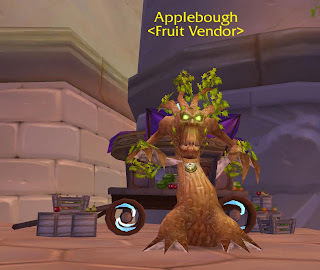 This year’s Winterveil shopping will be a pleasure with all these tempting presents at our finger tips. 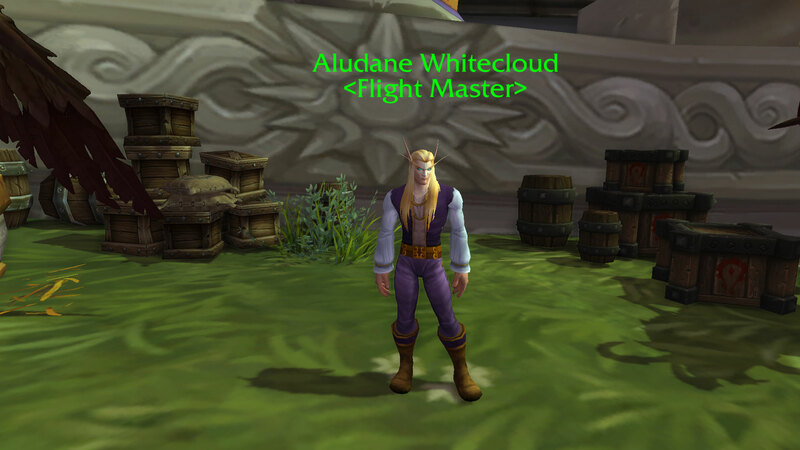 There is something for everyone in Dalaran. I admit to not liking Shattrah when I first saw it, i didnt like sharing space with the Horde, after all I play on a pvp server and hearthstoning to the same Inn as the guy you just made take res sickness can be a tad embarressing. That said, almost 2 years later, Ive got used to having massive taurens sat on my battlemasters and turning a blind eye to the male bloodelf paladin dancing on the mailbox. Thus I was a bit surprised when I discovered that in Dalaran there are separate Alliance and Horde zones. Ok there are two other Inns, that arent faction specific, but the principle itself in a neutral sanctary town just seems a bit odd to me. Its not as if we can start fighting after too much tequila, no alliance hero is going to start throwing punches in the centre town if he thinks that orc looked at his girl funny, it just isnt possible. So why the divide?